If this happens, reinstall both Xcode and Swiftify from the AppStore. Email contact@swiftify.com if the issue persists. Visit https://objectivec2swift.com/#/xcode-extension/ to get your free API key. 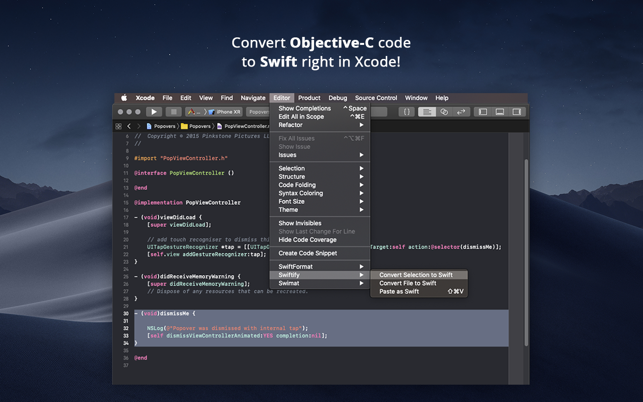 Swiftify Xcode Extension allows converting your Objective-C code to Swift 4.2 or 4.1 right in Xcode. 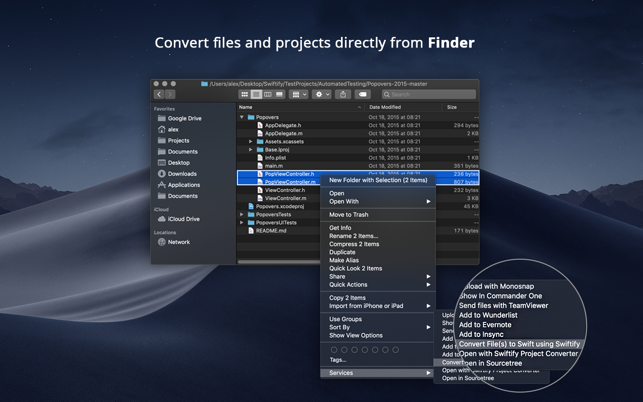 The app includes Xcode & Finder extensions and the Advanced Project Converter app best suited for gradual project migration. 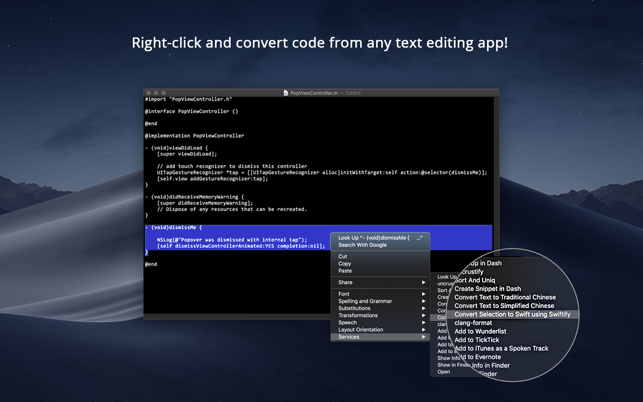 • Use Editor -> Swiftify menu to convert selection, whole file or clipboard contents from Objective-C to Swift. The converted code is transferred over an encrypted HTTPS connection and is NEVER stored on our servers! Swift and Xcode are trademarks of Apple Inc., registered in the U.S. and other countries. 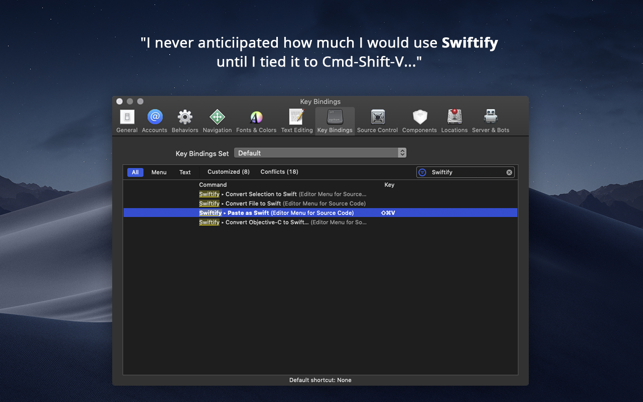 Swiftify (https://swiftify.com/) is not affiliated with Apple, Inc.
Added support for Swift 5. Now you can switch between the Swift 5 and Swift 4.2 outputs in the Preferences dialog. There is no mention of cost until you actually go to run the tool. It costs $99 a month yes A MONTH for anything useful. Save yourself some time and just move on to somethign else. The included Xcode extension can be used for free, and should be still useful for occasional usage. 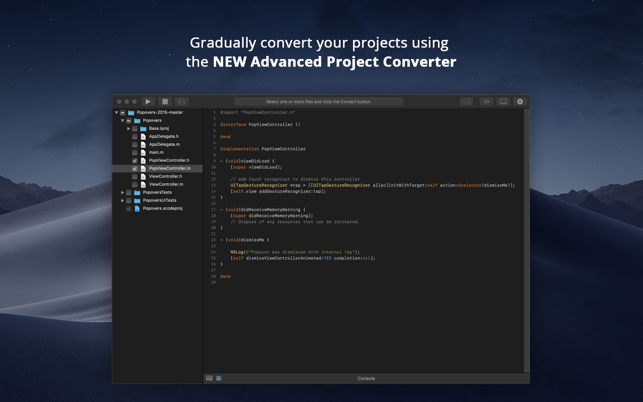 The Advanced Project Converter (which requires a paid plan) is our own Xcode-like IDE that covers some essential functionality missing in the Xcode itself. We will improve the UI to make all of this more clear to our users! Thanks for your feedback - it's a great encouragement to our team! Wish you all the best with your projects!